All this Holy Week, the prayers have brought us closer to Jesus. We have watched him take the path of suffering and death. Holy Saturday—today—has placed us in the silence of God that Jesus knew and shared with so many men and women who feel they are abandoned by God. And here we are tonight on the eve of the resurrection of Jesus. He conquered death. How? By his love, which was stronger. This is hard to believe for some people. We see so much violence in the world; recently it has been unleashed even more. The day before yesterday there was a terrible attack at a university in Kenya that killed 150 young people. I have spoken on the phone to our brothers who live in Kenya; they feel the shock which this event has caused throughout the country. And we are all shocked to see situations where human life no longer seems to have any value. I was recently in Rome. I had a personal meeting with Pope Francis. We all know how much he is committed to defending the poor, those who suffer injustice. He told me he is praying with us in Taizé in this year when we remember Brother Roger. I would like to ask you all to pray for him. Entrust him to God every day, even just for a brief moment. In Rome one image remains etched in my memory. In a church, there was a poster showing photos, just before their execution, of the 21 Coptic Christians who were killed. They were kneeling, and behind them each executioner had a knife. They died because of their faith. And how many Muslims die too because they are not on the right side! Let us not just remain shocked or accusers. Seeing all this sets all of us in front of these questions: Do you want to review the priorities in your life? Do not we often remain caught up in questions and discussions that in the final analysis are not so important? Do you want to be a peacemaker? If so, begin where you live! Armed conflicts are ravaging the Middle East, but also many other parts of the world. 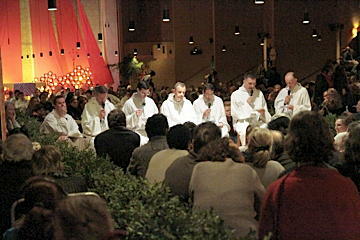 Last year many Ukrainian young people came to Taizé; here they met Russian young people. It was impressive to see the efforts that these young people made to listen to one another. So we asked ourselves what we could do to show our solidarity. The project was born to make a pilgrimage in three stages. Next week with four brothers and one hundred young people from all over Europe, we will go to Moscow to celebrate Holy Week with Orthodox Christians. Their date of Easter is set a week after our Western feast. Then we brothers will go to Minsk, Belarus, for two days. And the third step will be in Ukraine, where other young Europeans will join us in Kiev and Lviv. We will go empty-handed, with no project other than to join Christians in those countries in their celebration of the paschal mystery. Christ is our hope. He is alive. He brings us together. Did he not say these words: “When I am lifted up from the earth, I will draw all men to myself.”? So we want to come together, so that Christ can draw us together in his love. I will be very glad to experience the Easter celebrations with the Christians of those three countries. The singing, the words, the icons, the candles, all express the mystery of Christ who loves every human being. Putting our trust in Christ is not always a feeling that tranquilizes us. But let us remember that he always gives us his peace, and with it the courage to make tough decisions that shape our lives. If receiving Christ’s peace could become the priority in our lives, the world would change a great deal. Tonight we brothers are happy to have welcomed a new brother into our community—Roland from the Netherlands. And a week ago, Claudio from Chile also joined our community. They are now preparing to commit their entire lives for Christ. They will always be trying, again and again, to let themselves be led by the Holy Spirit. Walking on this road means learning to open our hands, not holding on to our own dreams and plans but heading into the unknown and believing like a child that God takes care of us. Yes we want to surrender ourselves to God, to live each day on the peace of Christ as nourishment. In this we brothers support one another. Communion among Christians is an invaluable support. You too, wherever you are: look for support in communion with other Christians.